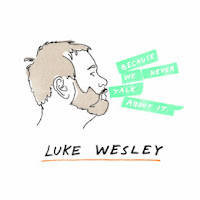 Atlas and the Anchor: Luke Wesley - "Because We Never Talk About It"
This week marks the release of Because We Never Talk About It, NYC indie piano-rocker Luke Wesley’s debut for Engine Room Recordings. Looking and sounding both like Elton John on steroids, the self-taught pianist may look more like a football player but he plays honest, funny and catchy indie rock with a slick pop sense. With self-deprecating humor, songs like “Sorry I’m Not Hotter”, “I Hope You Like This Song” and the tongue-in-cheek “Here Is Your Ballad”, Luke displays his razor sharp wit alongside his perfectly crafted pop. The piano-led music is emotional, raw and upbeat with little accompaniment other than guitar, bass and drums, for a sound created for the live setting. His gruff voice is soft when necessary but he can howl when he needs to get the point across like in the bittersweet “Keep It To Yourself”. First single, “I Hope You Like This Song” begins downtrodden and gloomy but quickly bursts into a buoyant and hopeful, funky romp. Another stand out track, “Ohio”, sounds like an homage to “Walking In Memphis” by Marc Cohn, whom he is often compared to, as an ode to his home state with a vamping piano riff. With the current indie scene set on making 80’s soft rockers Hall & Oates relevant again, Luke Wesley is on a one-man campaign to become the indie Billy Joel. Those are my words not his of course, he probably doesn’t even believe his own hype, and that is what sets him up for success. Far - "at night we live"
Circa Survive - "Blue Sky Noise"
Contest: Win a Prize Pack from The Dead Weather!